remained an iconic historical landmark in the Bay Area ever since. Join us as we make the Palace of Fine Arts an integral part of our BAD community! The event venue offers an indoor space for Vendor Village. Merchandise vendors will be have 10’x10′ vending areas, and be required to bring their own tables, racks, and other necessary items to set up their areas. Tents are not allowed this year. 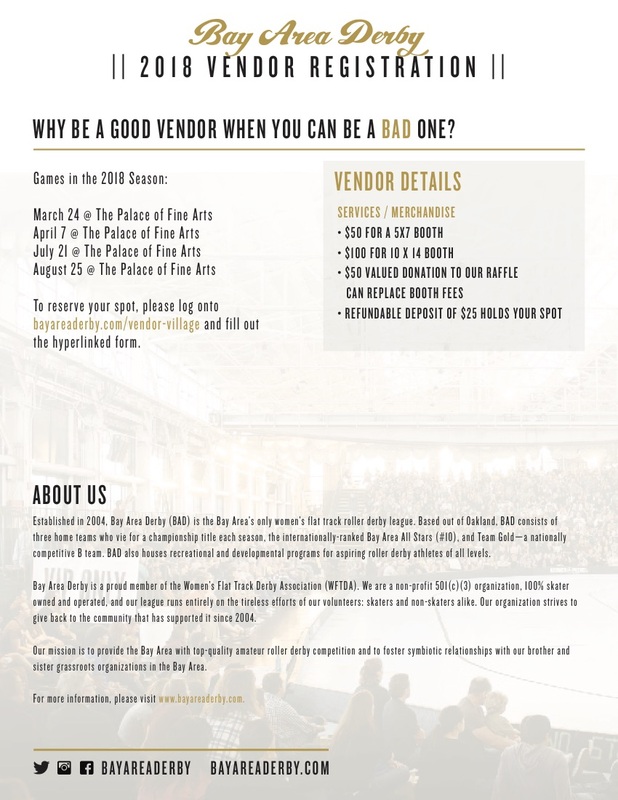 The fee for selling merchandise at our games is $50 per game. Vendors will have the option to offset some portion or all of their vending costs by making donations to be raffled off during our games. Email vendors@bayareaderby.com to reserve your spot. We are not accepting food vendors for this venue location.